Join a mother and daughter while they grow together emotionally and mentally as the daughter grows up to become a woman and have a child of her own. Enjoy the fun experiences the young daughter has such as playing with her mother's make up, jumping in muddy puddles, her first sleep over and first dance, and her wedding day - all through the perspective of the mother in a positive, empowering way. 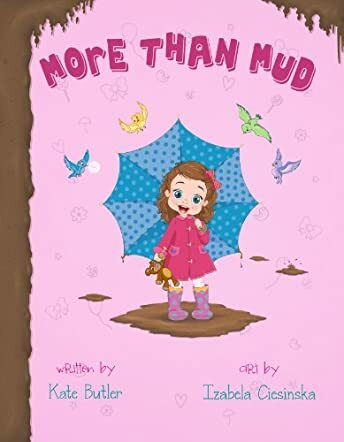 More Than Mud: Muddy Moments Made Magical by Kate Butler is a delightful children's book introducing them, as well as parents, to the concept of seeing life, its messes, and yourself as beautiful, as well as thinking in a positive way. The author has creatively captured the moments in life where a person or, as in the book, a mother, uses the power of positive thinking during a potentially stressful situation, and makes the reader see the beauty in it. The character of the little girl finds her mother's make up drawer and dolls herself up, just like she thought her mommy would do. If you the reader are a parent, you understand the mess that this situation can create. Instead of having the mother character become mad, the author tells of how the mother sees the beauty, creativity, and learning experiences in her daughter's actions. The author teaches not only children to believe in themselves, be confident, and strong, but teaches parents to empower their children by looking at their "messes" as growing, learning, and beautiful life experiences. This book is beautifully laid out, both in the physical design and illustrations as well as the text, dialog, and messages demonstrated within. A bonus is at the end of the story as the author provides readers with a question and answer section to help them find a positive way of thinking in most of life's "little messes". All parents, grandparents, and guardians will enjoy this book, but especially mothers with daughters.